Do You Know Where Your Centroid Is? If you filled out the 2010 Census form from the U.S. Census Bureau, then you had a part in defining the centroid — the point where the center of the U.S. population falls. Every 10 years, after the Census Bureau crunches the numbers and figures out where the centroid is, NOAA’s National Geodetic Survey (NGS) places a geodetic survey disk (also called a survey marker, monument, or bench mark) in the incorporated community closest to its exact geographic location. Why is this useful to know? How does the Census Bureau calculate the centroid for population? The process that the Census Bureau uses to figure out the centroid for the U.S. population is more complicated, but that’s the basic idea. Why is it useful to know where the centroid is? The Census Bureau has been tracking the centroid for a long time. Every 10 years, another point is plotted on the U.S. map. Connecting the dots forms a snapshot of how the U.S. population has shifted over time. NGS got involved with the effort back in 1960, when the Census Bureau asked NGS’s predecessor agency to place a geodetic survey disk at or very close to the exact coordinates of the centroid. “The data from that survey marker – its latitude, longitude, and elevation – are then integrated into the network of other survey control points that we refer to as the National Spatial Reference System (NSRS),” Doyle says. NOAA and its predecessors have maintained some version of this national reference framework ever since Thomas Jefferson established the Survey of the Coast in 1807. The NSRS is a huge network of about 1.5 million monuments, or bench marks, around the nation. These reference points form the foundation for all of the nation’s geographic mapping needs, including nautical charting, aeronautical charting, and topographic mapping. While this has always been important to NOAA and a host of other scientific and technical entities, Doyle notes that the advent of the Global Positioning System made the NSRS relevant to nearly everyone. Where is the 2010 Centroid? 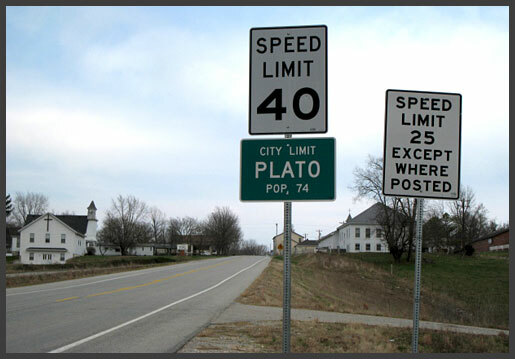 "The 2010 Centroid is located in the town of Plato, Missouri, in the south-central part of the state about 10 miles south of Fort Leonard Wood,” Doyle reveals. He led a team out to the site for reconnaissance in April so that they could pin down the exact location. Plato’s a small place, with a population of approximately 109. The Greek philosopher Plato, for whom the tiny town was named — author of The Republic — would no doubt agree with Doyle on this point. A formal dedication ceremony sponsored by the Census Bureau was held in Plato on May 9 at 1 p.m. Dave Doyle was there, together with the directors of the National Geodetic Survey and the U.S. Census Bureau. A good portion of Plato’s populace was present, too.